Figure A15. Bering Sea anomaly, interpreted as the Bering Sea slab, with (horizontal) [vertical] cross sections through (A)[D] the UUP07 p-wave) and (B)[D] the combined SL2013 and S40RTS s-wave models at 630 km; C) the location of the modern geological record that we interpret to have formed during the subduction of the slab. The Bering Sea anomaly (Figure A15) is located below the Bering Sea, is detached, and is flat-lying at the 660-km discontinuity. Towards the south it is close to, but separated from the Aleutian slab. Towards the west, it is close to but separated from the Agattu slab. Towards the north, it connects to the N-S trending Mayn slab. Gorbatov et al. (2000) suggested that the separation between the Aleutian slab and the Bering Sea anomaly would have been caused by the Kula-Pacific ridge subduction and estimated a ~48 Ma age for break-off. 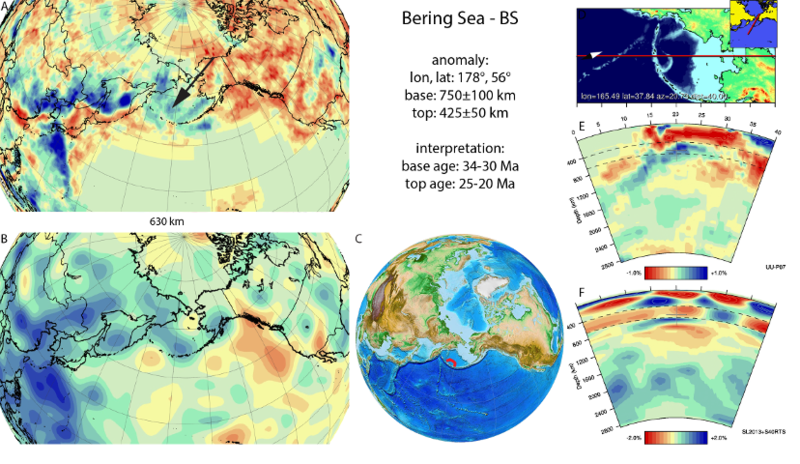 There is no clear reason, however, why the Kula lithosphere would become located farther north than the Pacific lithosphere to explain the separation between the Bering Sea and Aleutian slabs. The Bering Sea contains, moreover, evidence for a short-lived Cenozoic intra-oceanic subduction zone to the north of the Aleutian trench. This subduction formed the volcanic arc of the Bowers Ridge which is clearly visible in the bathymetry of the western Bering Sea (Nokleberg et al. 2000). The presence of a trench filled with as much as 12 km of Cenozoic sedimentary rocks at the base of the north and east slopes of the Bowers Ridge suggests that the unit formed in a Cenozoic arc-trench system that faced northeast (Nokleberg et al., 2000). We do not see any other slab that could represent the Bowers Ridge subduction other than the Bering Sea slab. Recently Wanke et al. (2012) dated volcanic rocks of the Bowers Ridge at Oligocene-Miocene (32.3±2 to 22.7±2.7 Ma), which we adopt as the age range of the subduction of the Bering Sea slab. The size of the Bering Sea slab however seems to be bigger than the Bowers basin, which may suggest that the close vicinity of other slabs may lead to blurring of the tomographic image increasing its apparent size.